When last we met, I blogged about working on two projects and having more time with the start of the school year. “Ha!” I say, more time, yes. More time to take care of a variety of things. More time for school issues for two of three spawn to crop up. Interestingly, more time to move away from adapting book to screenplay to a new screenplay idea, definitely not children’s topic. Time for a laptop to burn itself out, and a smart phone to decide to quit working simultaneously. More time for me to twiddle my thumbs on ideas while dealing with school issues, taking care of myself and home. More time to journal and read actual books, and listen to podcasts on creative process when the replacement phone came in. Still haven’t replaced the laptop. Currently using an old slowpoke one that cuts out on me in the middle of things. I’ve really been processing how my writing process works. Some people can do the daily grind well. I think of an old college friend who is making her living as a steamy writer, Cherie Noel. or another old college friend, who also is pumping out words daily, at an admirable pace and whose latest steamy book is due out at any moment, Jenna Kendrick. These two write in the romance genre, and I have tried, I really have, but I just can’t. I was never much of chick flick girl. I have read my share of Harlequins as a teen and beyond, but it’s just not where I live in writing. Anyway, these two genre masters can pump out thousands of words a day! Day after day! I admire them greatly for it. Their books are fun, by the way, go check them out! But it’s just not how my creativity works. I do journal almost every day, and sometimes that is all I get. I have finally learned about myself that on one level I am always writing, waking, sleeping, no matter what I am doing in a given moment. For that, I am grateful. I am swimming internally in creativity and ideas all the time. However, actually processing those thoughts and getting them to paper or typed on a screen takes me a lot of time in fits and starts. I can see an entire movie version of an idea in a moment’s time, and then take years to get it from that initial mental burst to a viable story. I struggle to come up with the words to match the thoughts, and I love doing it. It is hard and constantly editing work for me. It makes me a little jealous of my friends above. I have done Nanowrimo a handful of times and never completed it. It helped me learn that I have receptive creativity and productive creativity spates of time. Some days or weeks, I just have to process internally while dealing with other aspects of life. Some weeks, the train tracks of thought link into each other and I can get from city to city in my mind really easily on the page. I’m calling plot points cities for the sake of the set up. The first couple of times at Nanowrimo were pretty damning for me, because life happens a lot around here, my old blog was musingsinmayhem for a reason. I beat myself up a lot for not making the daily word count. Later, I used Nanowrimo as a way to knock out chunks on existing projects, to plant myself in a chair and just do it. I can’t say I was always happy with the results. I learned it’s okay to be me and accept that some days, I just don’t meet the chair. Some days, I steep myself in life and books, movies, podcasts, what a world we live in these days! Those days inform my writing for the better. Some days, I don’t seem to do a whole lot of anything from the outside, but worlds are revealing themselves inside. Some days, a walk brings a poem, and that is a necessary part of who I am, and leads to stories, book projects, screenplays. So, if you’re thinking of your writing process, and feeling a little frustrated, that is just fine and part of the process, too. Enjoy it, the next wave of creativity will rise, and break on the shore. Sometimes that hovering moment before the words spill out is the best moment of creative process. When everything is glistening like glass in the sun, that’s where the magic is. I spent much of the summer balancing family needs and working on adapting Felix the Comet into a screenplay, not the easiest endeavor. I always envisioned this story as both a book and a movie. There is so much more editing to be done, but a few other avenues are presenting themselves, too… Time to wait and see how this may pan out. Since school started back up last week, with one back to college, and two in school here, I have a bit more freedom for my own thoughts to collect and do something productive. I am currently working on the text for an animal characters picure book with a great artist. We discussed for years working on a book together, but my attention was involved in other projects, unable to devote time to a sweet little story. However, she and I have spent those years emailing back and forth developing the project on the side. We both know what we want the story to be, have a decent arc, I just need to actually write it, in one place. It’s a real shift from pretty straightforward fiction to screenplay or picture book writing. The shift from screenplay adaptation to creating a picture book plot and dialogue isn’t nearly as far. I have conditioned myself over the summer by deleting a great deal of the descriptive elements from fiction, This task as prepared me to approach this smaller project more mindfully, not fill a lot of unnecessary detail that will show in Cathy J’s illustrations. May this project move swiftly now from the working title “two cathys project” collection of notes into a viable draft by the end of this week, maybe beginning of next. Wish me luck and uninterrupted time, please! The other Cathy’s swift sketches are adorably inspiring! Weird to be writing a blog post about the poem that interrupted the story that was waylaid by the next novel idea in this evolving companion series that is pocketed before I get back to the novel I am currently trying to finish. Can anyone else relate? Without going into too much, chalk it up to my usual mayhem, I was not sparking on anything for months. Now that one or two life things have transitioned a bit, the ideas are popping again, fast and furious. I was going to write more, but above was notes from this morning, and I can’t recall now what I was going to say otherwise, because, I wrote and posted the poem and now I really need to write the story for my friend’s fundraiser that I started last weekend!! When that is done, I may write the story for the picture book i’ve been delaying for two years at least, with my artist friend, and then just maybe, I will be able to dip back into the “current manuscript” I am working on. Oh, I recall now, these shorter things, poetry and short-short story are really where I live writing-wise. This is what comes easy to me. The longer arc of a novel is more like work, even though I really love exploring the depths and layers of the tale, it is so much harder for me to write like that. So, I need to pull out of the manuscripts now and then and play around where I’m more comfortable, and love writing again, for the sake of the creative spark. Coffee is glorious, coffee is good. Coffee is bittersweet, improves my mood. Drink two mugs, then the day I’ll greet. I am very excited about announcing the availability of Felix the Comet after our long journey through writing, editing, and publishing. So much, that I am still a wee bit …anticipatory. 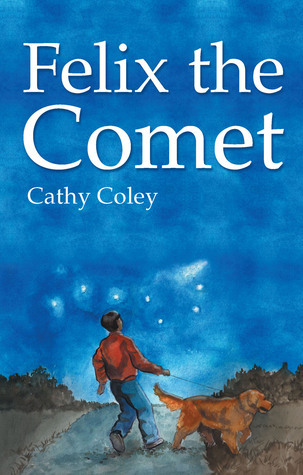 As it currently stands, Felix the Comet should be available in ebook format through Lulu.com sometime on Monday July 14, 2014! I will let you know better when I know better myself, as I am curbing my enthusiasm while remaining cautious about the prospect. Expect a definitive announcement on Monday. For those who donated to my Pubslush fundraiser, I will be sending you a PDF version via email. My hope is that you will read and add a review on Lulu’s site for Felix the Comet. I am hoping to offer a deep reviewer discount for bloggers who review children’s, middle reader, or YA novels. I will work that out as I can. Inquiries or contact info appreciated via comments below. A few more weeks are needed for the printing process, and to offer Felix in other ebook venues. Then it will be available by print only through Lulu.com, because of the smaller format I chose. Ebook versions will be available through virtually every major ebook source: Lulu, Kindle, Nook, iBook, and Kobo. Thank you for your patience, your time, your support, and your donations. I am truly happy about this entire experience. I may be going dark on the internet before Monday, July 14th, but watch for more on my Facebook page and Twitter via links in the right column here. You have something brewing in the back of your mind. All you have to do is capture it. While that thing fades, slips back into the water of sleep. The high school kid has not gotten out of bed in the dark. you avoid tripping over swirling dueling cats. Your spouse groans that you’ve woken him again. to stay upright, righting the boat with your hand trailing along the hall’s wall. through bleary eyes, just the red glow of the numbers on his clock. other hand to the wall, and get back into bed, try to recapture. but it comes up only with the weight of water, then nothing. The bathroom light and fan blare on, the door slams. So much for that thing. Then the day really begins. You are getting up to auto brewed coffee, you hope. still need to dual zone the house. Upstairs is a sauna, someone turned off the ceiling fan in the living room. No wonder you were suffocating last night. like waves on the shore disturbing the sand around your feet. Coffee, there is the coffee, yes it brewed. needs to find its way to the toaster. he will not be able to register for his classes. Sure enough, a few hours later the frantic texting starts again. But for now, I have my coffee. The high schooler has boarded his bus. The little is coming downstairs with Daddy. Grandma is stirring for her day. as I ascend the stairs to shower. before grandma comes back from her morning exercises. the wonder, the blue, the night’s long lost thing. rinsing shampoo out of my hair. Then the house is all quiet, just me and my noisy brain. I try again, to find the quiet in myself, but it’s never long enough to find that thing. And I can still feel it, know it’s just out of view. just out of the deepest blue, below the surface. I try again to find that thing.